We couldn't be more happy about the success of Pillars of Eternity. You guys have been great with your feedback and support! Again, thank you very much. We've been working hard on fixing bugs and stabilizing the game for 32-bit users. The 1.02 patch will be released shortly – hopefully before the weekend. As a token of our gratitude for your past and ongoing support, we wanted to share some exciting new things we have in store for Pillars of Eternity. These features are scheduled to appear in the 1.10 update, which is currently slated for early summer. First off, the big one: We are introducing turn-based combat. There will be a toggle for this at the start of the game, just next to Expert and Trial of Iron. 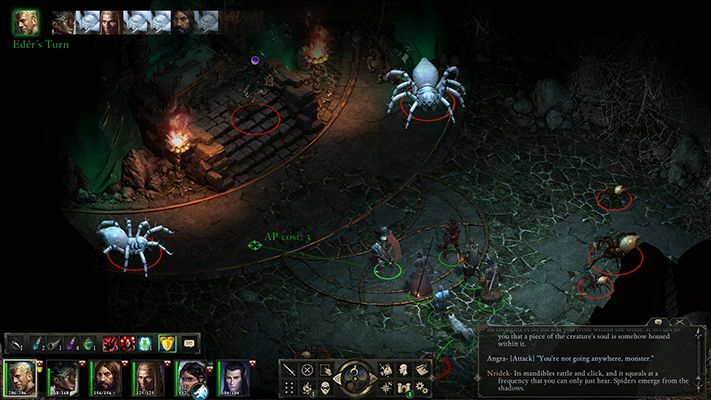 This feature is very much the work of Tim Cain, and it makes Pillars of Eternity play a lot like the RPG classic The Temple of Elemental Evil. Second, this will require an overhaul of the attributes system. We were never really one hundred percent happy with the current incarnation of the attributes, and this will give us the chance to balance it further while also introducing two new stats: Initiative and Action Points. These two stats are only available when playing in turn-based mode. Tim: I love turn-based games. This actually goes back to something Chris was saying, when I worked on South Park… right when I arrived there it was a real-time game and one of the things I was asked was to make it turn-based. It’s easy to turn real-time systems into turn-based ones, so I’m just throwing that out there [as he looks towards the other team members].